Building a streamlined recumbent myself really appeals to me. Until that time, I occupy myself with investigating all sorts of materials that could be used for building a fairing and with looking around for other people’s ideas for streamlining. 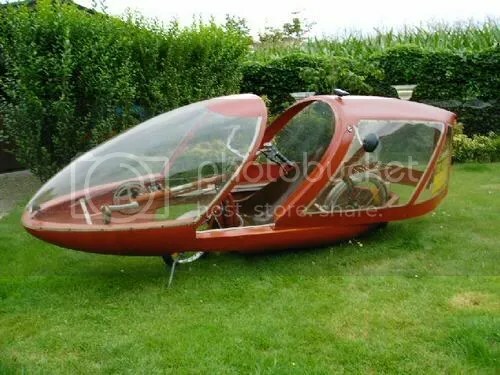 Surfing around on the internet, I regularly come across striking designs such as this "Velerique". This one was built in about 1978 by Erik Abergen of Belgium and was sold with or without streamlining. 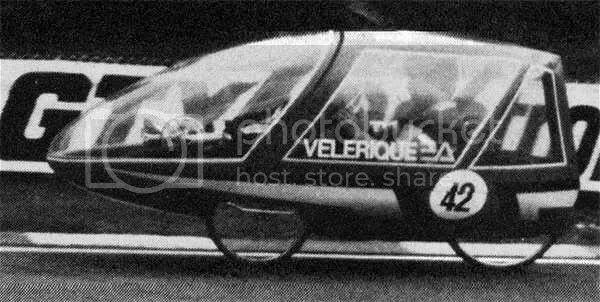 The Velerique achieved 34.9 mph (approximately 50 km/hour) in the English HPV championships in 1982. With a few adaptations, I should be able to make a Velerique fairing for my Optima Rhino. versatilevelo op Waar is de Jouta DX/ZX gebleven ? Martin op Waar is de Jouta DX/ZX gebleven ?